A strange and unlikely experience last night at the OK Hotel in Seattle. Opening a show for Gruntruck was a band, unadvertised but quietly word-of-mouthed, known as Ten Minute Warning. This would mean nothing except that this band was the great lost missing link (along with the U-men) between early 80's Seattle punk and late 80's, er, grunge (ouch! I used that word! So sue me.) They broke up originally in '84, and though they recorded a number of things, were not lucky enough to ever get a record released, so there is no documentary evidence of their existence. A number of now famous Seattle rock luminaries were heavily influenced by this band's legendary live shows, and a couple turned up last night, incognito. So why should we care? Well, the sheer unlikeliness of it all for starters. Except for a new singer, it was all original members. On guitar: Paul Solger (lead) and Duff McKagan (indeed him - used to drum for the Fastbacks, too); on drums Greg Gilmore (later in Mother Love Bone); on bass David Garrigues. Everyone looked fit and healthy, and they rocked. Took about half the set to really warm up, but for a first gig in 13 years they were pretty damn good - and this was not a one-off; they appear to be older, wiser and quite serious about this, more gigs are planned. There were no stupid cover songs, and only 3 of their own "oldies". After a few more gigs they should be pretty great. 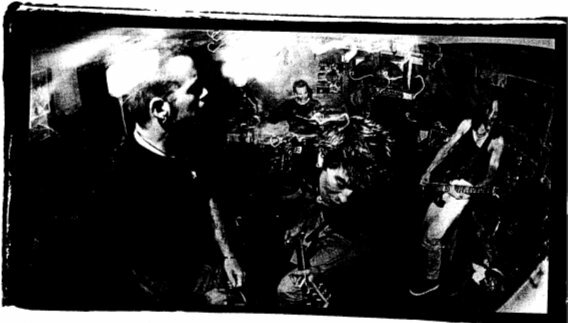 Interesting thing is that they were almost the first Seattle band to make the shift from doctrinaire, fast punk rock to something slower, heavier and more varied. TMW caught all sorts of crap for it, but on the other hand their live shows were legendary and they attracted quite a following. When they opened for Black Flag, Henry Rollins, in a widely quoted remark, approvingly called them a "punk-rock Hawkwind". I don't quite see it, but I have heard that there were a lot of, shall we say, psychedelic INFLUENCES floating around at those shows. Really, the big operative word in those days was "Stooges". The only other bands covering similar post-punk territory in the early 80's were the equally-legendary Umen and the haphazard but at-times-inspired Malfunkshun. The problem was that TMW left no record of their existence. In those days there were almost no indie labels in Seattle (or anywhere else), and while they made several attempts at recording, nothing came together and they finally fell apart in 1984. There were no singles, not even a compilation track, and judging from the old recordings I've heard, no engineer in town was capable of capturing TMW in the studio. So there was always a feeling that their story was unfinished; I guess the time was right for them to get back together, and prove to themselves and everyone else that they hadn't just imagined the whole damned thing. Sitting in the studio the past week listening to (and mixing) the tracks for their upcoming Sub Pop EP (ably recorded by Hal Ermine at AVAST! ), I was repeatedly struck by how much Green River (and even Pearl Jam) copped from these guys. From my description here, one would be forgiven for being a bit skeptical (I was!) but in fact these tracks are pretty cool, and just crackle with live energy. I'm pretty psyched about this, and so is Jon Poneman at Sub Pop, not least because you couldn't release a LESS-HIP record right now, when it's considered rather tacky to rock out.